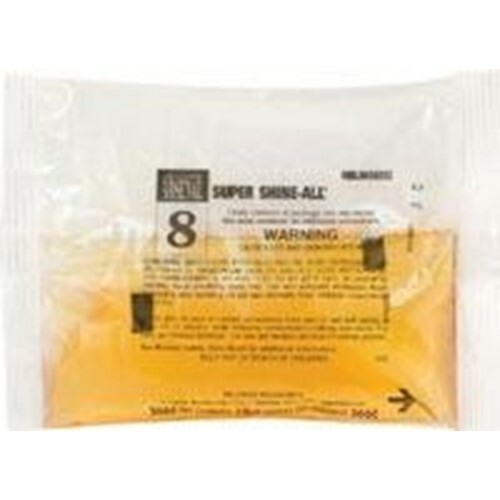 Arsenal Super Shine All is a concentrated formulation is unparalleled cleaning ability. The soil is broken up quickly and held in solution for easy removal. Super Shine All is designed for cleaning wood and gym flooring. The faster and more efficiently a product works, the less labor required to do the cleaning job. Plus this cleaner is part of the Green Select products that are formulated to minimize the impact on the environment and reduce the risk to humans. Concentrated, neutral pH formula won't harm your floor finish. Perfect for cleaning resilient tile, asphalt tile, vinyl floors, synthetic floors, terrazzo, quarry tile, paver brick, natural stone and coated wood floors. Protective sheen helps preserve and protect. Excellent choice for damp mopping and auto scrubbing. Effective in hard or soft, hot or cold water. Biodegradable. Phosphate free. Neutral pH won't harm floor finish. Case Specs: 36 4 oz. packets per case, sold as one case.